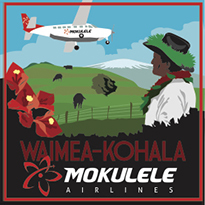 The Big Island of Hawai`i is home to the town of Waimea which takes us to our next airport destination. Waimea, in the native tongue means, “reddish water”. It was given this name because of the color of the streams that flow from the hapu’ forests in the Kohala Mountains just north of town. 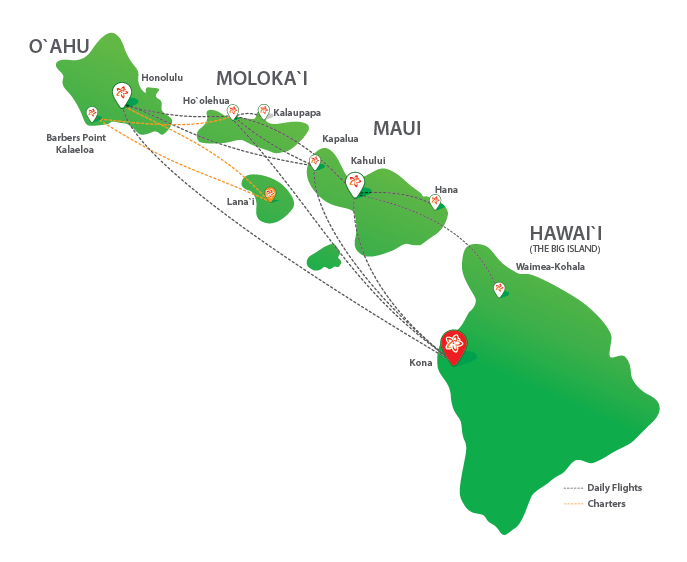 It is 32 miles northeast of Kona, 43 miles northwest of Hilo, and roughly a 30 minute drive from the Waikoloa Resort. 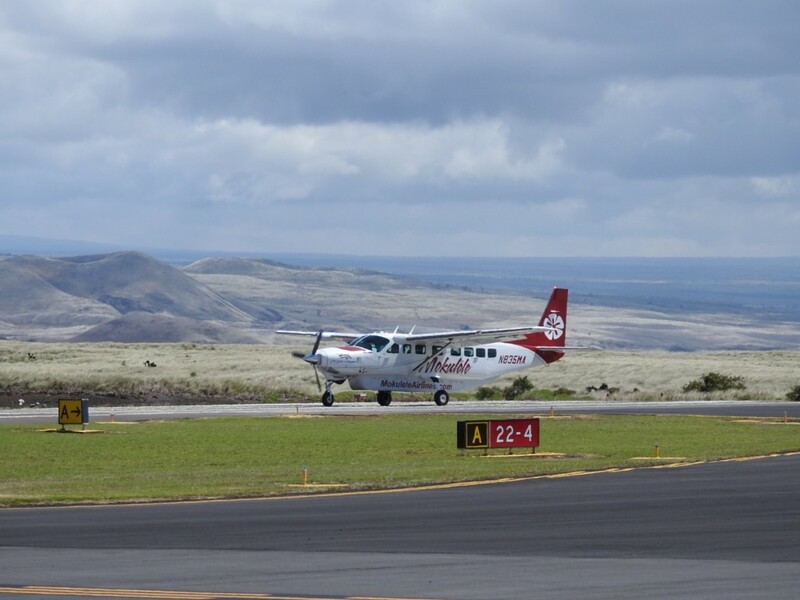 However, the Waimea-Kohala airport is just 2 miles southwest of town, giving travelers easy access to all of Waimea’s attractions. The Big Island is just that Big! Geographically we can hold all the other islands, twice! Hawai'i also boasts 15 out of 17 temperate zones – you can make a snowball at the top of Mauna Kea (the tallest Mountain in the world measured from the base of the ocean floor) and the same afternoon, be snorkeling down at Kealekekua Bay with incredible sea life and spinner dolphins! If you're looking for rest and relaxation, the Kohala Coast is where it's at! From Hualalai and the Four Seasons Resort, heading north to the Waikoloa Marriott, Hilton Waikoloa Village, Mauna Lani Bay and Bungalows, Fairmont Orchid, Hapuna Prince Hotel and the Mauna Kea Beach Hotel (founded by Nelson D Rockefeller in 1964), you can expect to be pampered in the lap of luxury! World class restaurants are found at the resorts and beautiful Waimea town. Unlike most of Hawaii’s coastal resort-style living towns, Waimea offers a different view to Hawaiian culture. Parker Ranch, dating back to 1809, is one of the town’s historic paniolo (Hawaiian cowboy) ranches. Abundant in horses, cattle, and lush green rolling hills, there’s no better place to see the countryside by horseback or ATV. The Kohala Mountain Road stretches north out of Waimea giving visitors a beautiful quaint drive towards the town of Hawi. There are seven valleys between Waipio and Pololu Valley boast of lush rainforest and breathtaking waterfalls. Should you want another amazing hike go check out Akaka Falls and Rainbow Falls. Along the way, you’ll have views of Haleakala on Maui across the Alenuihaha Channel and the western Hawai’i coastline. For the stargazers, Waimea is a great starting point to rent your 4-wheel drive vehicle and head to the observatories on top of Mauna Kea. These telescopes are some of the best in the world and provide breath taking mountain top views of the universe. The Kohala Mountain Road stretches north out of Waimea giving visitors a beautiful quaint drive towards the town of Hawi. Along the way, you’ll have views of Haleakala on Maui across the Alenuihaha Channel and the western Hawai’i coastline. For the stargazers, Waimea is a great starting point to rent your 4-wheel drive vehicle and head to the observatories on top of Mauna Kea. These telescopes are some of the best in the world and provide breath taking mountain top views of the universe. Yes, $2 per night, cash/check – run by the Airport Administration. 39 diagonal spaces in front of the main terminal. Right in front of the main terminal/lobby. If more than 10 days please make station aware. No, there is no parking pass necessary. 45 minute check-in before flight as all flights are closed 15 minutes before departure. Is there taxi/ bus service available?